Renovations in the commercial industry must be handled with proper supervision and detailed workmanship. First State Contractors is at your aide when it comes to commercial renovation services in Ridley, Pennsylvania. Pre-Construction Planning – Prior to renovations, the contractors design a budget, work up plans, and outline a schedule for the project to be completed. Project Scheduling – A schedule that keeps the project moving towards the deadline. 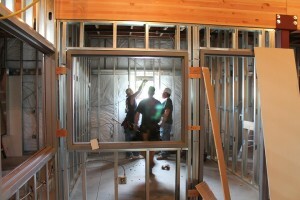 Cost Estimating – The cost of time and materials for the renovation. Design Review/Value Engineering – The review of each stage of the projects’ development and determine the value of the project. Construct-ability Review – Evaluation to determine if the project is feasible. Scope Definition – Documents that clearly detail the materials, schedules, cost estimation, and all other client requirements. Weekly or Bi-weekly Meetings Based on Schedule – Meetings should be scheduled on a regular basis to keep the project up-to-date. Detailed Schedule Updates – Updates expressed as the commercial project progresses. Subcontractors Weekly Meetings (Schedule, Change Orders, Safety, etc.) – Subcontractors have regular meetings to discuss change orders, safety, and any other alterations to the project. Owner Change Orders- Time Extensions – If the client makes changes to the project that affects the deadline, it can be extended to accommodate the renovations. Inspections (State & Local) – State and local officials must inspect the property to make sure it is not in violation of city or state building codes. Payment Applications – A schedule that includes weekly and monthly payment deadlines. Request for Information (RFI) – The contractors and subcontractors can ask for more detailed information about a vendor. Submittals- Subcontracts – Subcontractors submit requests for materials prior to the start of work. Material Ordering – Contractors should order the most up-to-date and superior materials. Sub Back Charges – Charges for damages or incomplete work. Independent Inspections & Testing – An independent inspection team that tests and inspects the work to insure the project was completed correctly. Punch List – A list of items that must be completed before the final payment is made to the contractor.